It has been an honor to have served as executive director over the past few years as Pride was central to so many commemorative events. From 2012 to 2015, we welcomed more than 200,000 people aboard, educated thousands of children, engaged our local communities, provided use of the vessel for corporate and non-profit use, captured the imagination of hundreds of thousands of individuals, and attracted millions of dollars in ad value from the media we generated promoting Baltimore and Maryland. I have been inspired by the many people I have met who have a personal story, a real connection, to Pride. Our history, our heart, and our soul are in Baltimore and in Maryland, and we want the rest of the world to discover and enjoy Maryland’s Pride. As we set sail in 2016, we continue our nearly four-decade mission to promote historical maritime education, foster economic development and tourism, and represent the people of Maryland in ports throughout the world. We accomplish this by providing free educational deck tours, student programs, public day sails, overnight guest crew opportunities, private charters, dockside receptions, and partnering with the corporate and non-profit communities to extend their impact. I am very excited about Pride’s next chapter! In 2016, our plan is to sail in the Chesapeake Bay in spring and fall, and voyage along the East Coast and into the Great Lakes during the summer. When we are sailing our local waters, we will welcome aboard thousands of students, local citizens, and visiting tourists, and partner with dozens of organizations and corporations to host dockside receptions or private charters. 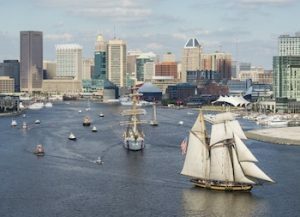 As we travel to the Great Lakes, we will participate in tall ship festivals, introducing tens of thousands of individuals to Maryland’s Pride and continuing to spread positive messages of Baltimore and Maryland as we travel regionally and nationally. We need your support to keep the wind in our sails! • Caulking to preserve the physical strength of the vessel. • Replacing one of our sails (fore staysail) for age-related issues. • Replacing our satellite transceiver, satellite phone, and some communications equipment (laptop, phone, radio) to meet regulations. • Servicing our magnetic compass for continued long-term dependability. • Overhauling our emergency rescue boat – again, age-related – for continued dependability during any emergency operations. Please click here to help us complete this necessary maintenance in 2016! Since her commissioning in 1988, Pride of Baltimore II has become one of the most well-known U.S. sailing vessels in the world, sailing 250,000 nautical miles and visiting more than 200 ports in 40 countries. She has captured public imagination worldwide and spread positive messages of Baltimore and Maryland. With your help, we can keep her sailing and inspiring people for generations to come. During this season of giving, we ask that you make a donation to keep Pride sailing, and provide support for our upcoming maintenance needs. Every donation – regardless of the amount – makes a difference! Please be sure to check with your employer to see if they will match your donation and double your impact. And, just by donating on December 30 and December 31, you will be entered to win a Day Sail for Two in 2016! It’s our gift to you. As always, we thank you for your continued support. P.S. Click here to read a brochure that highlights some of our programs, travels, and accomplishments over the past few years.